We Love Techno Switzerland will take place at X-Tra Zürich and will turn this unique location into a huge techno temple. That night, the finest the scene has to offer join toghether to create a few hours of infinity. However, all labelling becomes irrelevant when, starting on the evening of the 6th of April 2019 and continuing into the not so small hours of the next day, well-known legends of techno and fresh new talents stand side by side behind the turntables. Toghether they will create what this event is so well known for: the ecstasy of the best combination of sweet synthesizers, ballistic beats and a bombastic bass. Be part of another unforgettable night and share the spirit. 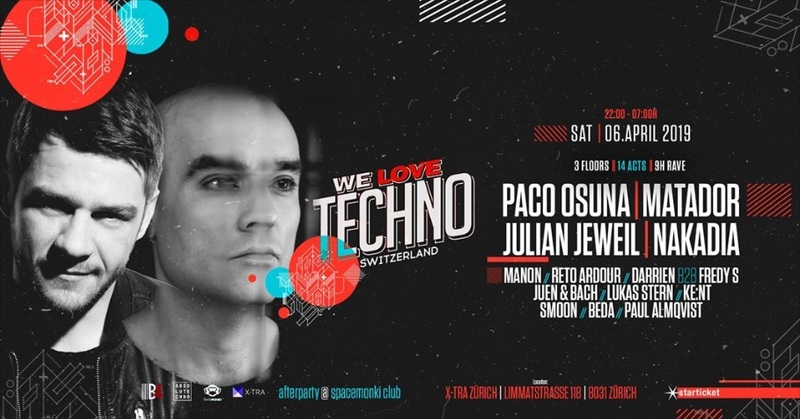 Auf geht’s zur unvergesslichen WE LOVE TECHNO Switzerland. Nach der unvergesslichen, wunderbaren und tollen Show vom 08.12.2018 im Xtra, haben wir erneut grosses auf 3 Floors geplant. WE LOVE TECHNO Switzerland vereinigt das Feinste, was die Szene zu bieten hat, zu ein paar Stunden Unendlichkeit. In der Nacht des 06. April 2019 jedoch, wird jegliche Etikettierung irrelevant: Urgesteine und junge Grössen der Technoszene werden Seite an Seite hinter den Plattentellern stehen und das Publikum mit dunklen, harten Beats zum Raven bringen. ➤ Limited Super Early Bird: !!! Sold Out !! !